This article examines the recent history of North American and Western European environmental law to illustrate the pervasive weaknesses and failures of law to limit unsustainable exploitation and degradation of the biosphere. Although these regions are generally perceived as global leaders in environmental law, with some impressive laws on paper, there are significant deficiencies in their ‘Maginot Line’ of environmental defences. Furthermore, these regions’ ostensibly superior environmental performance compared to other areas of the world is partly due to exporting their ecological footprint both spatially (to developing countries) and temporally (to future generations), rather than being a function of their environmental laws. 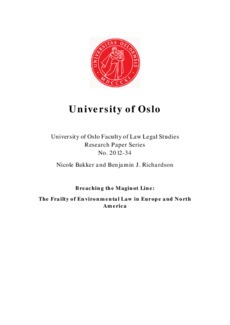 The article focuses on environmental law at a European Union-level (rather than within individual Member States) and comparable efforts at the federal level in Canada and the United States. While no direct empirical research is provided, the article draws on other literature sources of such research. The article contrasts some patterns and traditions in European and North American environmental law including differences in regulatory styles, and discusses legal responses to biodiversity conservation to illustrate in more detail one aspect of their approach to environmental governance. Despite some regional differences, in the bigger picture North America and Europe have so far both failed to substantially reverse the poor environmental prognosis.